Andrew James Whitworth (born December 12, 1981) is an American football offensive tackle for the Los Angeles Rams of the National Football League (NFL). He played college football at LSU and was drafted by the Cincinnati Bengals in the second round of the 2006 NFL Draft. Whitworth has been voted to the Pro Bowl four times, and has been named a First-Team All-Pro twice (2015 and 2017) during his career. A native of Monroe, Louisiana, Whitworth attended West Monroe High School in West Monroe, Louisiana, where he played high school football for the Rebels under coach Don Shows and graduated in 2001. He was a part of two Louisiana Class 5A State Championship teams in 1998 and 2000 when the school was listed by the National High School Football Tony Poll as National Champions. He was also part of four straight district championship teams in one of the toughest districts in the state. Whitworth was rated by CNNSI.com as the sixth-best offensive line prospect in the nation. He was a tennis champion in Louisiana, and was also an excellent golfer. He participated in the first-ever U.S. Army All-American Bowl game on December 30, 2000 along with other future LSU players Marcus Spears, Marquise Hill, and Ben Wilkerson. Whitworth did not play in the 2001 season as he was redshirted. In 2002, he started every game, and was recognized as a first-team Freshman All-American by The Sporting News and Football Writers Association. As a sophomore in 2003, he started all 14 games. The team went 13-1 en route to a BCS national title with a Sugar Bowl defeat of Oklahoma. He led the team with 1008 snaps and credited with 105 key blocks, including 82 knockdowns. In 2004, Whitworth led the team with 799 snaps from scrimmage as the Tigers went 9-3 with a Citrus Bowl berth against Iowa. His play was key for an offense that scored 39 TDs and averaged 395.6 yards per game. He was credited with 96 key blocks, including 66 knockdowns, and played every offensive snap during a four-game stretch against Georgia, Florida, Troy and Vanderbilt. Helping LSU to an 11-2 record, he played left tackle in 2005. That season was capped by a 40-3 Peach Bowl win over Miami (Fla.). He played every offensive snap in nine of the 13 contests, for an offense that averaged 374.1 yards per game. By not allowing a sack all season, he finished his career with 22 straight games of no sacks allowed. He was credited with 104 key blocks/knockdowns. Whitworth played in the East–West Shrine Game on January 21, 2006 in San Antonio, Texas. His 52 career starts from 2002-05 rank second in NCAA Division I history behind Derrick Strait of Oklahoma (53 starts, 2000–03). He earned All-Southeastern Conference first-team honors in each of his last two seasons, including a consensus nod as a senior. Whitworth at Bengals training camp in 2012. Whitworth was selected by the Cincinnati Bengals in the second round (55th overall) in the 2006 NFL Draft. He made his NFL debut on special teams September 10 at Kansas City. He started at left guard in his second game, September 17 against the Cleveland Browns, as part of a line shuffle were left guard Eric Steinbach replace injured Levi Jones at left tackle. Whitworth helped the Bengals pile up 481 yards against Browns, including 145 rushing yards by Rudi Johnson. He was in the starting lineup for the remainder of the season, in part due to the number of injuries that depleted the Bengals' offensive line. On November 12 vs. the San Diego Chargers, he helped the offense produce a season-high 545 yards and career-high 440 yards passing from Carson Palmer. He also had a key block on Rudi Johnson's seven-yard touchdown run in first quarter. On July 25, 2008, Whitworth agreed in principle to a four-year extension worth a reported $30 million that would keep him in Cincinnati through 2013. In 2009, head coach Marvin Lewis decided to move Whitworth from guard to left tackle and saw immediate impact. He started all 16 games of the season, allowing just five sacks and helping running back Cedric Benson have a breakout year rushing for 1,251 yards. On December 12, 2010 Whitworth caught a one-yard touchdown pass from Carson Palmer against the Pittsburgh Steelers. It was the first of his career, and he was the first Bengals offensive lineman to catch a touchdown pass since 1995. In January 2013, for the first time in his career, Whitworth was named a left tackle on the AFC Pro Bowl team. During the 2014 season, Whitworth allowed zero sacks and only one hit on quarterback Andy Dalton. Due to his success, many pundits and experts have claimed that Whitworth was snubbed out of a second Pro Bowl berth, however, he was named second-team AP NFL All-Pro. He was also snubbed for NFL Top 100 Players of 2015, but was voted as the 67th best player by his peers in the 2016 list. Whitworth signed a one-year contract extension with the Bengals on September 26, 2015. On March 9, 2017, Whitworth signed a three-year contract with the Los Angeles Rams. In his first season with the Rams, Whitworth made it to his fourth Pro Bowl. He was ranked 87th by his peers on the NFL Top 100 Players of 2018. In 2018, Whitworth helped the Rams reach Super Bowl LIII after they defeated the Dallas Cowboys in the Divisional Round and New Orleans Saints in the NFC Championship Game. The Rams lost to the New England Patriots in the Super Bowl. Whitworth and his wife, Melissa, have four children—twins Sarah and Drew, Michael, and Katherine. Whitworth is active in the community through his BigWhit 77 Foundation. He hosts a fund-raising golf tournament in Louisiana and serves as a motivational speaker to youth groups in both Greater Cincinnati and in Louisiana. ^ "Andrew Whitworth Pro-Football-Reference". pro-football-reference.com. ^ Davenport, Gary. "Bleacher Report's 2014 NFL All-Pro Team". ^ "2014 All-Pro Teams: Analysis of the full rosters". ^ "'Top 100 Players of 2016': No. 67 Andrew Whitworth". NFL.com. ^ Patra, Kevin (September 26, 2015). "Bengals sign OT Andrew Whitworth to 1-year extension". NFL.com. Retrieved September 26, 2015. ^ Langer, Travis (March 9, 2017). "Rams Agree to Terms with Whitworth and Woods". TheRams.com. Archived from the original on March 12, 2017. Retrieved March 10, 2017. ^ Patra, Kevin (March 9, 2017). "Rams set to swipe Andrew Whitworth from Bengals". NFL.com. 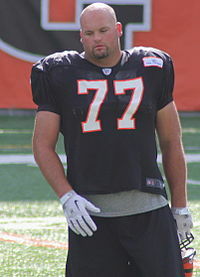 Wikimedia Commons has media related to Andrew Whitworth.